Punjab Chief Minister Parkash Singh Badal today launched the second World Bank (WB) funded ‘Punjab Rural Water & Sanitation Sector Improvement Project’ of Rs.2200 crore aimed at improving Water & Sanitation Services and creating open defecation free environment in all villages across the state. In his inaugural address, the Chief Minister thanked the World Bank especially it’s Country Director Mr. Onno Ruhl for getting this prestigious project sanctioned much before the closure of earlier project costing Rs.750 crore, which was slated to be closed on June 30, 2015. The Chief Minister said that he was confident that with the concerted efforts of the departments of Water Supply & Sanitation and Rural Development & Panchayats Punjab would set an example by completing this gigantic task within two years much ahead of the deadline of 2019 fixed by the Government of India under ‘Swachh Bharat Abhiyan’. Mr. Badal said he was delighted to learn that the total achievement under the first project was 125% which was unprecedented so far in any development project funded by the World Bank in our country. The Chief Minister elaborated that the focus of new project was to provide a toilet and water connection in all the households within next three years (2015-2018). Likewise, all the existing rural water supply schemes would be augmented to provide 70 liters per capita per day (lpcd) against the current consumption of 40 lpcd. Mr. Badal pointed out that enhancement of water supply scheme to 70 lpcd would make it technically feasible to release water connections to all households as per demand. This in turn would lead to financial sustainability of Rural Water Supply (RWS) schemes and the villagers would have access to minimum 10 hour water supply.Badal said that it was a matter of great pride and satisfaction that Punjab would become the first state in the country to achieve the prescribed norm for supplying potable drinking water at par with international standards in the rural sector besides making our state free from ‘open defecation’. 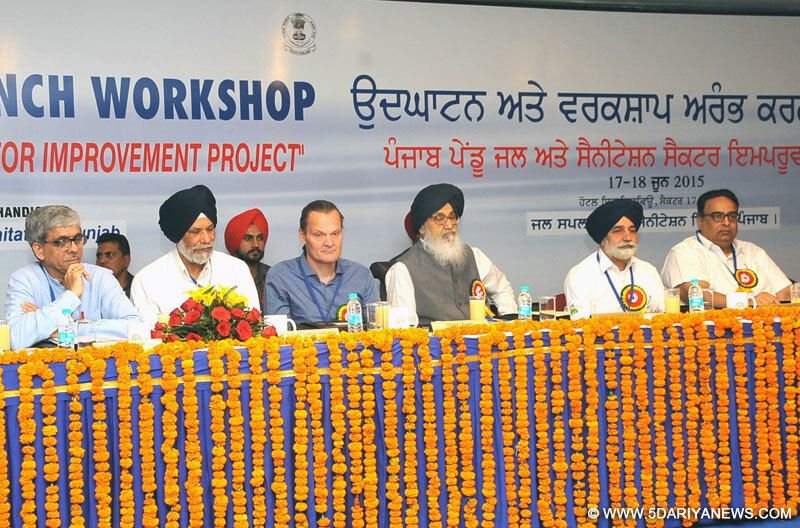 Mr. Badal said that the state government was already committed to provide the clean and safe water to the people of Punjab especially in rural areas and thus earmarked Rs.300 crore to provide treated water from surface water resources such as rivers/canals to water quality affected in 121 villages of Moga and Barnala districts. Dwelling on the relevance and significance of Skill Development in the present scenario, the Chief Minister urged the WB Country Director to help the state in skilling our youth to enable them to be gainfully employed. Mr. Badal mentioned that he was the convener of sub-group of ten Chief Ministers from different states to study and give recommendations for making the national skill development mission formed by the Prime Minister Mr. Narendra Modi far more broad-based and result oriented.In an exclusive meeting over a dinner with the delegation of WB team led by Country Director Mr. Onno Ruhl on Tuesday, the Chief Minister sought their support and cooperation for allowing the state to have an exclusive Water Supply & Sanitation Sub-Project on Design, Build, Operate (DBO) terms for 110 waterlogged villages in Sri Muktsar Sahib, Fazilka, Bathinda and Faridkot districts of Malwa Belt. Likewise, he also emphasized that WB may allow special projects for different clusters of the state where the quality of water was adversely affected due to inherent factors. The Chief Minister also impressed upon the Country Director to help the state in sanctioning special projects for overall growth and development of villages to revive the rural economy. Similarly, Mr. Badal also sought WB’s intervention for funding its various ongoing tourism and cultural projects to showcase state’s glorious heritage and rich legacy across the globe. Responding positively to the proposal put forth by Mr. Badal, the WB Country Director said he would again come to the state next month to have detailed discussions on these issues and mooted a proposal to constitute joint teams of officers from WB and State government to put these proposals on fast track. In his address, Rural Development & Panchayats Minister Mr. Sikander Singh Maluka assured the Chief Minister that his department would make all out efforts to make our state free from open defecation by motivating the rural populace to go for toilets in their houses and dwelling units. He pledged support and cooperation to the Water Supply & Sanitation Department for the timely completion of this project. On the occasion, the WB Country Head Mr. Onno Ruhl said that he envisioned Punjab as a front runner state to lead the country in the ‘Swachh Bharat Abhiyan’ as the state has performed exceptionally well in the earlier project and far better performance was expected too from it in the second project. In his welcome address, the Chief Secretary Mr. Sarvesh Kaushal said that the launching of second WB project would ensure access to more reliable and better quality water supply and sanitation facilities to the rural households besides strengthening the water quality monitoring methods and developing mitigation measures. Speaking on the occasion, the Additional Chief Secretary Water Supply & Sanitation Mr. Suresh Kumar said that there were total 33.15 lac individual households in Rural Punjab. As per census 2011 data coverage with toilets is around 70%. At present, toilets in remaining 30% households were still to be constructed. In order to provide clean environment, Project had a provision to provide individual households toilets for remaining 6.5 lac households. The toilets would be built by the beneficiaries themselves or by anyone appointed by them. It would benefit women and marginalized communities who currently do not have access to sanitation (toilet) in the household. Mr. Kumar further stated this challenging task on completion would ultimately result into Open Defecation Free State. On the occasion, the Chief Minister honored the best three Gram Panchayats Water Supply & Sanitation Committees of village Jaspalon (Ludhiana), Bargari (Faridkot) and Tasoli (Patiala) for overall performance in implementing these W&S schemes. The Chief Minister was accompanied his Special Principal Secretary Mr. Ajoy Sharma. Apart from the members of WB team, all the Deputy Commissioners, Additional Deputy Commissioners (Development) and officers/officials of the department of Water Supply & Sanitation and Rural Development & Panchayats.